Ústí nad Labem ( [ˈuːsciː ˈnad labɛm]), formerly known by its German name Aussig, is the 7th-most populous city of the Czech Republic. It is the capital of its eponymous region and district. Ústí is situated in a mountainous district at the confluence of the Bílina and Elbe rivers. It is a major industrial center and, besides being an active river port, is an important railway junction. The Czech name was Latinized as Usk super Albium and Germanified as Aussig or Außig. Prior to Czechoslovak independence amid the dissolution of Austria-Hungary following the First World War, the town was usually known in English as Aussig, but sometimes also referred to as Aussyenad, Labem, or Oustí nad Labem. The factories of Aussig—as it was then known—were an early center of the National Socialism ("Nazi") movement. The German Workers' Party in Austria (Deutsche Arbeiterpartei in Österreich) was founded on 15 November 1903 and later gave rise to the Sudeten German Party and Austrian National Socialism. Their books continued to be printed in Ústí even after the formation of Czechoslovakia in 1918. During the 1930 census, Ústí nad Labem was home to 43 793 residents: 32 878 considered German, 8 735 Czech or Slovak, 222 Jews, 16 Russians, and 11 Hungarians. Ústí was ceded to Nazi Germany with the rest of the Sudetenland in October 1938 under the terms of the Munich Agreement. On New Year's Eve of that year, the Nazis burnt down the local synagogue; a meat factory was later raised in its place. The Jewish community in Ústí nad Labem was mostly exterminated over the course of World War II amid the Holocaust. In April 1945, the city was severely bombed by the Allies. Under the terms of the Potsdam Conference and the Beneš decrees, the city was restored to Czechoslovakia and most of its German population expelled after Germany's defeat in World War II. In May 1948, the Communist government passed a new constitution declaring a people's republic. Communism continued until the 1989 fall of the Berlin Wall set off a series of events which are now known as the Velvet Revolution. 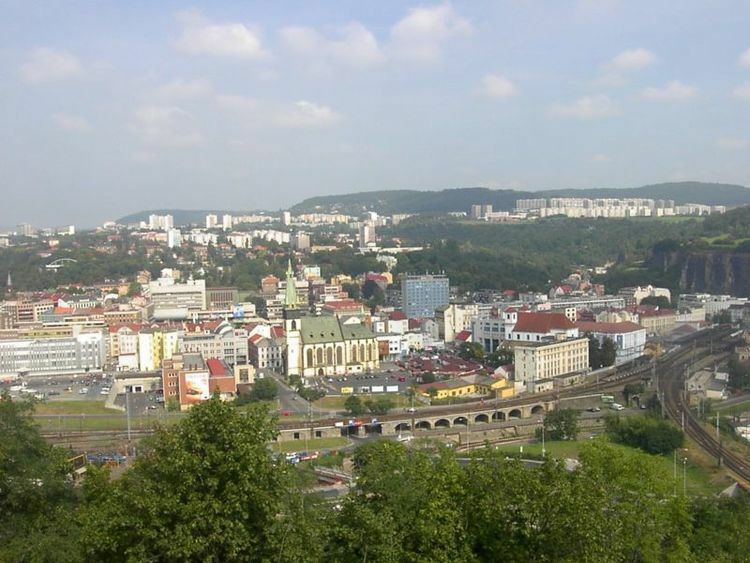 Today, Ústí nad Labem is a major industrial city of the Czech Republic with substantial chemical, metallurgical, textile, food, and machine tool industries. One of the most famous Bohemian artists, the painter Anton Raphael Mengs (1728–1779), was born in Ústí nad Labem. Among the city's other natives are the illustrator and designer Heinz Edelmann (1934–2009) and the writer Vladimír Páral (born 1932). Modern sports figures born in the city include Milan Hejduk (born 1976), hockey player and former team captain for the Colorado Avalanche; Michal Neuvirth (born 1988), hockey player for the Philadelphia Flyers; and Jiří Jarošík (born 1977), association football player, formerly of Chelsea FC and Celtic FC player, currently of Deportivo Alavés. Goalkeeper Tomáš Černý was born in the city in 1985, he currently plays for Scottish Premiership side Partick Thistle. The city is connected to the international highway E 442 (Liberec, Děčín, Ústí, Dresden) and first class highways (I/8, I/30, I/13). It is also directly connected to the express highway D8 (Berlin – Prague) that intersects the western border of the city. Some sections of the highway are already in operation, with the completion of the entire highway in Czech territory currently planned for 2016. The city has a network of mass transportation that includes bus and trolley bus lines. Usti nad Labem is an important railway node with four railway stations that is intersected by international lines Berlin-Vienna and Berlin-Budapest-Beograd-Sofia (Baltic-Orient). The backbone international line is the national railway line No. 090 – I. transit railway corridor State frontier Decin – Usti nad Labem – Prague – Breclav – state frontier which is part of the IV. Trans-European Multimodal Corridor. The re-construction on the way and the modernisation of the line to meet the parameters of increased line speed will add quality to personal and commercial transportation. On the line section that intersects the city centre interregional railway transportation, suburban transportation and the backbone city mass transportation will come together. The Eurocity (EC) and Intercity (IC) trains connected to the European railway network stop regularly in Usti nad Labem Central Station. Mariansky Bridge was opened in 1998. The road bridge over the Elbe was built over a period of five years. The city has invested over CZK 750 million ($37,500,000) to build it. The bridge won an award of the European Association of Steel Structures - ECCS (European Convention for constructional Steelwork) European Steel Design Awards. International Association for Bridges and Civil Engineering ranked Mariansky Bridge between the 10 best structures of the world for the last decade.